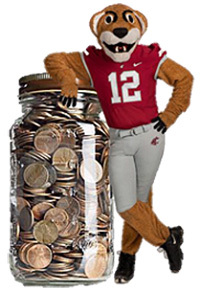 PULLMAN, Wash. – With the goal of boosting financial literacy among students, Washington State University will host its first “Know Your Money Day” on Oct. 7. The day is part of a national campaign led by SALT, a financial education and engagement program created by the nonprofit American Student Assistance. WSU has been a SALT partner for just over a year. SALT uses a combination of online and one-to-one interactions to teach students and recent college graduates the money knowledge they need to pay for and pay back college costs. Flores’ staff will be available 11 a.m.-2 p.m. Tuesday, Oct. 7, near the entrance to the food court in the WSU CUB. Students are encouraged to stop by to play games, pick up financial literacy information and sign up for a free SALT membership. • Sign up for SALT membership at the CUB booth or online at http://saltmoney.org/wsu. • Complete a SALT scavenger hunt at the booth. • Visit CMMP in the CUB 11 a.m.-2 p.m. on Oct. 7 to snap a picture in front of the booth and post it on Facebook or Twitter: facebook.com/DOS.WSU or @DOS_WSU. Currently 4,300 WSU students are SALT members. Flores’ team hopes to boost that number by at least 1,500 students in the coming months, which would result in a discounted fee when WSU seeks to renew its contract with SALT in April. CMMP was created last winter to build financial competencies among WSU students to help them make responsible decisions about financing their education and repaying their student loans.